This entry was posted in Economic History, Economics, Federal Reserve, Finance, Wall Street and tagged banco santander, bankia, banking, deposit insurance, free banking, limited liability, RBS, rigged market. Bookmark the permalink. Well to some degree government is property of the banks, and banks are property of the government. It’s a big, sick corporatist symbiosis, and totally unsustainable in the long run. I can’t complain about Rabobank. They mostly invest in agriculture, so I believe they are pretty solid. From my experience in banking, it is finding the business borrowers outside of traditional housing, that can give you the margin, without the big risk of the credit card market, that is the key to running a solid bank. But finding SME’s that can grow their business in this market is going to be difficult. Many banks don’t take too many risks and have high reliance to property collateral. Many business owners will not put their personal property in the line to invest and expand. This definately holds back business investment. This is where the Government could assist SME’s with high tech cutting edge business ideas to expand, without seeking equity angels and diluting control. However would loand guarantees result in malinvestment or further innovation? Reblogged this on Omar Westerberg. The saurians evolved into the avians. As much as I like dinosaurs, I prefer birds. Lets hope the banks evolve soon. A bit out of left field, perhaps, but that quote was my immediate association when I saw the heading. 🙂 It’s the first sentence of the sci-fi book Battlefield Earth by L. Ron Hubbard. It’s not a good book by any standards, and I can’t really recommend it; but somehow, I still find it very entertaining. And it’s a great first line! Never read that, though I love sci fi. It’s something like 1.5 million words long if I recall correctly. It seems that the way for free banking, or free anything for that matter, is not to be seen just yet. These websites seem like a healthy transition. Keep it up! But as I note they are hopelessly outgunned without deposit insurance. Nearly dysfunctional? You sir, win the award for understatement of the year. Will the average lender be able to conduct research and know whether the borrower will be able to repay? Even if they repay, is this the best way to allocate money? Don’t financial intermediate (supposedly) allocate the resources efficiently? Are you suggesting that banks do good research that somehow gives them the ability to determine whether debtors will repay? Because 2008 was all about the fact they weren’t doing that. I’d say the average guy on the street will end up looking a lot savvier than the banks. If they share the profit/loss risk they’re gonna do the research needed. Indeed Muhammad, you have hit upon the primary cause of this debacle. Yes, but I fail to see a real utility in disbanding deposit insurance. As I’ve said, there are plenty of capital structures under deposits that can take a hit (instead of having the hapless depositors take the hit). Other ideas like clawback of bonuses from the last N years in case the bank goes under might be more useful. Something I forgot to comment on just now; I certainly hope that no Govt money whatsoever funds its way into these business. Perhaps the author forgot that such an intervention is just that, a govt intervention! If the dinosaur banks are getting government money than everyone should get government money. I believe in a level playing field. I’d prefer no liquidity insurance (I have no idea why government is in the insurance business at all — as I showed last week, the financial sector can bail itself out) but if someone gets it, everyone should. Otherwise it’s just rigged monopolism. How does deposit insurance contribute to that? I’d prefer that the barriers of entry be lowered but still with deposit insurance in place. If the bank goes under, the structure under deposits could and should suffer (secured bonds, unsecured bonds, preferred shares, regular shares). That being said I never understood why wages in banks must be higher than the average. Just because they’re closer to the money? I can understand higher wages in the judicial system (to avoid corruption), because checking each and every legal case would be impossible; but for banks, it’s very easy to tell when and if someone stole some money (so the same argument does not apply). I’d prefer no liquidity insurance (I have no idea why government is in the insurance business at all — as I showed last week, the financial sector can bail itself out) but if someone gets it, everyone should. Otherwise it’s just rigged monopolism. Banking is like giving a bunch of high school seniors twenty cases of beer, a pound of pot, two ounces of coke, and hoping for a good outcome. You forgot the hookers and bath salts. It is all about risk! Deposit insurance is just transferring that risk too the commons. Does not it just become a circular argument? If you eliminate deposit insurance it would be interesting to see the effect it would have on both depositors and lenders. Skin in the game. But regulators and central planners just wanna blow up the bubble as big as possible rather than considering the consequences. They should leave derivatives to Calculus class. Bankers f**kin with forces they can’t handle… If you gonna be an astronomer, you best be able to deal with astronomical numbers without making the system crumble upon touch. 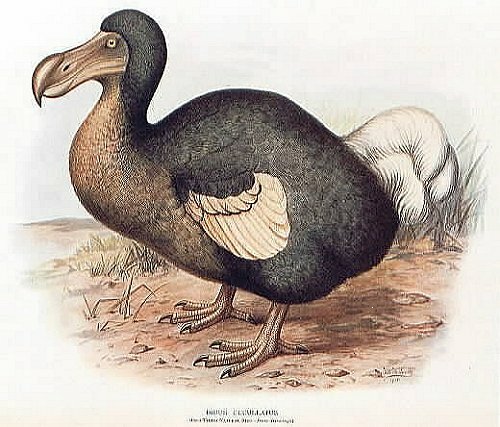 How ironical that you should illustrate your post with the DODO, the extinct bird that used to exist uniquely in tiny MAURITIUS in the Indian Ocean, where the Central Bank is currently considering to institute deposit insurance for the banking system! In the “good ole days” bankers lived by the 3-6-3 rule: borrow at 3 percent, lend at 6, and hit the golf course by three. The numbers may have changed a bit, but they still have a nice little earner, fully guaranteed. I couldn’t agree more with you, Aziz, the banks have long outlived whatever usefulness they may have once had, and should no longer be propped up by the rest of us. Banking: Gathering the capital of a community/nation/world by offering an interest rate on capital and lending said capital back into the community and higher IR and making the spread. Its only been done for 5,000+ years. Why does anybody think that today is different then any other day? Banks (really bank shareholders) are up a creek. Check their stock prices out recently. Next up, bank bond holders. A better question would be, “What is capital?” In 2012. Or, “What does the government consider capital?” In 2012. Or, “What do the bankers consider capital in 2012?” Really, the same thing, these days. 2000-3000 years ago, slaves were considered capital. Perhaps governments will pledge money to the IMF. This money is our taxes. i.e. we are effectively slaves. We were not asked to vote on the IMF handouts. If this pledge supports the system and we get repaid, all is well, we make a profit. If not what then? BTW if you have a lazy 50 million capital you can set up a bank in Ukraine quite easily. Go to Ukraine and see how many teller machines there is! Maybe the CIS is the new west of capitalism. Because it ignores the fact that nearly all banks, except for maybe the top 5-10 (those are the guys that are involved in “zero-sum derivatives casino and shadow banking whorehouse”), ARE “lending to businesses that they determined would add value”. And these numbers quoted, $250 million of loans!, is a drop in the bucket of total loans. Small community banks like my own book about $60 million of loans a year and we are the 4,000th or 5,000th largest bank in the US. Very small. Larger regional banks can book upwards of $500 million to a billion a year. And there are more than 8,000 banks in the US. I agree that some changes need to be made in the industry, but I don’t think that this analysis is really thought through but rather meant to be provocative and incendiary. I would like to see some real data on private lenders – which by the way, have historically not always had the best reputations if/when their borrowers don’t repay (i.e. knee-busters). And finally, private lenders almost always have higher rates than commercial banks, not lower. This was a sloppy “analysis”. P2P lending is the way of the future. You hit the deposit insurance barrier-to-entry on the head. The only thing lacking is trust.